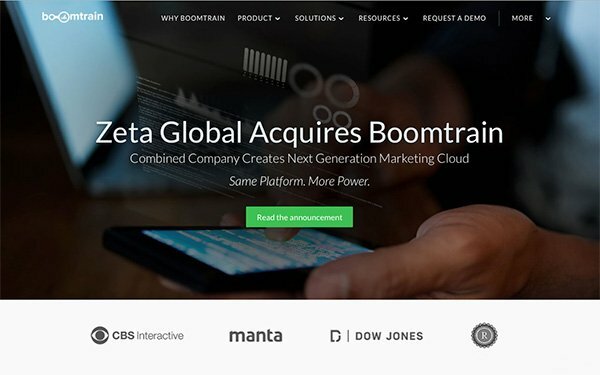 Zeta Global announced the acquisition of Boomtrain for an undisclosed price on Tuesday, adding Boomtrain’s machine-learning platform to Zeta’s Software-as-a-Service (SaaS) marketing cloud. This marks Zeta’s first acquisition since raising a late-stage equity and debt funding of $140 million in April, and the company’s tenth acquisition in as many years. Steve Gerber, president and COO of Zeta Global, says the acquisition will help move Zeta’s services into a “next-generation marketing cloud with artificial intelligence at its core, as opposed to an add-on solution.” Boomtrain has particular expertise in the media and publishing verticals, he says. Gerber says the acquisition will also help accelerate the company’s growth in machine learning. Founded in 2012 and based in San Francisco, Boomtrain’s marketing platform helps brands send personalized email messages and mobile notifications at scale. For now, the Boomtrain platform will fall within the Zeta Global marketing cloud. Gerber says that in the intermediate term, Boomtrain will effectively become a personalization module in the Zeta cloud. Over the next six to nine months, the company plans to integrate the two platforms to expand its marketing cloud. Zeta will also be acquiring Boomtrain’s book of business, which includes brands like CNBC and Dow Jones. Chris Monberg, Boomtrain’s co-founder and CTO, will remain on board at Zeta Global as the company’s new chief technology officer. Monberg will be working alongside Scott Ollivier, the chief product officer at Zeta. Nick Edwards, co-founder and CEO of Boomtrain, will also be involved in the transition and will become an advisor on Zeta’s machine-learning advisory board. Boomtrain has raised just under $15 million prior to its acquisition.